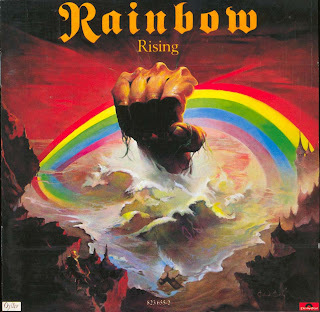 After the somewhat underwhelming debut to his post Deep Purple career, Ritchie Blackmore reconfigures his new band Rainbow, keeping vocalist Ronnie James Dio but replacing everyone else. In come Jimmy Bain on bass, Tony Carey on keyboards and Cozy Powell on drums, and the results are instantaneous. Rising is one of traditional power metal's all-time classic albums. At just 34 minutes and containing only six tracks, Rising is quality ahead of quantity: three of the tracks are brilliant. Tarot Woman starts with a long intro courtesy of Carey's sophisticated keyboards, before Powell lays the foundation for Dio's latest mystical, magical lyrics. Blackmore finally makes his mark a good three and half minutes into the track, and immediately owns it with a solo full of bliss. Stargazer is eight majestic minutes built on a persistent driving riff, a slower pace building enormous power and culminating in a terrific melding of Dio's vocals and Blackmore's guitar. But if there is a first among equals, it is album closer Light In The Black, another eight minutes of supreme metal, this time at a faster pace and with Blackmore at the forefront from the get go, his interplay with Carey's keyboards nothing short of enchanting, and his solo work starting at the four minute mark setting a standard of metal magnificence that still captivates. Starstruck is the best of the other three tracks, a lighthearted, nimble and more traditional melody underpinning Dio's vocal strength. Rising packs a powerful punch, that fist on the album cover art filled with unstoppable intent, fury, and most of all, talent.